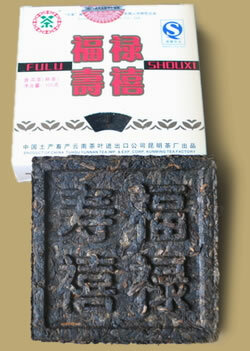 Fu Lu Shou Xi Pu-erh Brick is a new item from Kunming Tea Factory in 2007, available in ripe and raw, 100 grams each. The Chinese characters for "Fu, Lu, Shou ,Xi" are raised on one side, means good fortune, salary, long life and happiness. Another side pressed with CNNP's Zhong Cha logo. This ripe Pu-erh brick is a good candidate for Pu-erh collector. PREPARATION: To prepare Pu-erh tea from bricks, pry out the desired amount leaves and place in a teapot. Rinse by covering with boiling water and quickly pour off. Cover with boiling water again and let steep 5-30 seconds (depending on how light or dark you want the tea) and serve. Pu-erh tea can be steeped 10-20 times.